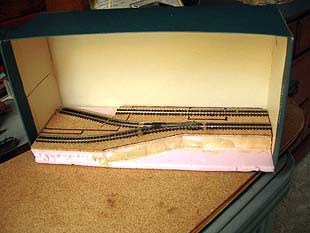 and if you are building a layout in a shoebox, get in touch! 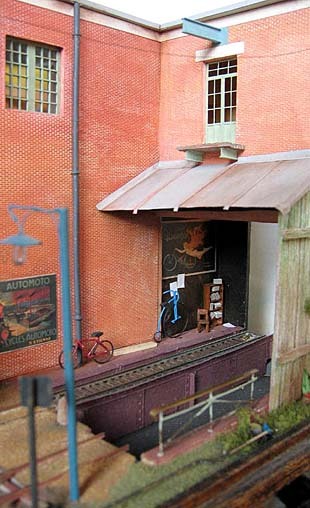 From the multi-talented François Fontana comes this delightful bicycle factory complete with its own tramway — in the size of a shoebox. It’s called Cycles le Berlan. 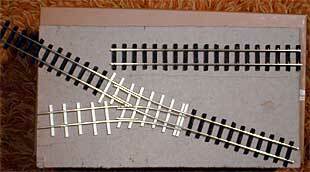 Measuring 33×11.5 cm (13×4.5 in), this little OO9 railway uses both a hidden sector plate and a visible traverser! If you look closely at the photos (also by François Fontana), you’ll see that the factory makes both the familiar bicycles and also velocypédes (with the large front wheel and small back one). The setting is 1890 in Saint Etienne, France, the country of bicycles. (below left) The sector plate, hidden within the loading dock building, serves both the visible layout tracks and a hidden storage and fiddle siding at the rear. (below right) The visible traverser actually functions, to complete a runaround capability. 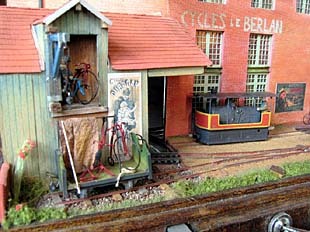 The photo also gives us a close look at the reason for this little tramway’s existence: the famed Cycles le Berlan! To see more of François’ work, and for a look at one of the best magazines available for micro layout reading, get a copy of the quarterly Voie Libre magazine (free English translation available), from the same publishers as France’s leading model railway publication, Loco Revue. Carl’s Imports is being built by Brian Wilson, from British Columbia, Canada. Brian is working in O9 scale (On18 – 1/4″ scale on 9mm gauge). You can keep track of his progress at his website. 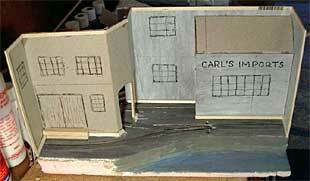 UPDATE: Brian has now reached the mockup stage, with roughed-out cardboard scenery in place to judge the effect. Here’s what the layout looks like at this point, but there will no doubt be more changes as new ideas strike. Stay tuned for further updates — and visit the website for progress reports. 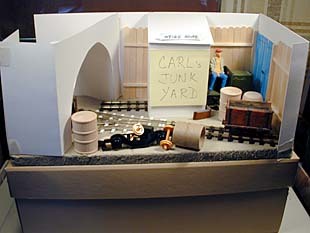 Carl’s Junkyard is under construction by me, Carl Arendt. 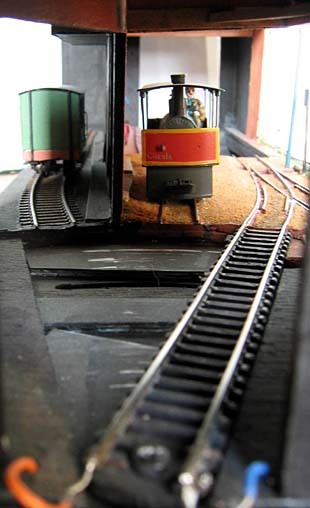 It’s a Gn15 layout (1:22.5 scale on 16.5mm gauge), using Sidelines rolling stock. This is a mockup made of kraft paper and popsicle sticks to see how well things will fit. It’s cramped, but possible. I’ll keep you updated as progress continues. UPDATE: Several readers have inquired about practicality of Gn15 in a 13″x7″ space. So here’s a topside view, showing all trackage. Stub switch is built as shown in my book. Sector plate is removable.